A stock market chart is a visual representation of a stock's trading history. As a stock trades throughout the day, each transaction consists of a single price and volume e.g. 100 shares at $7.75. After a specific time, you can identify an open, high, low and close for the stock and the number of shares traded. You can also identify the number of transactions but this data is a bit harder to get. Shown below is a typical daily, stock chart. The stock is Microsoft Corporation. It has a ticker symbol of MSFT. Displayed is a stock market chart, which is displaying three months of stock price history, covering the time period from May 9 to Aug. 5, 2005. This data is presented in a typical Open/High/Low/Close (OHLC) and volume format. The blue line at the bottom, on top of the volume is the 50-day exponential moving average (EMA) of the volume. So, you may ask, what does all this mean. When the stock market opens, the first recorded trade of a particular stock is considered to be the opening (open) price. As the stock trades during the day at some point there will be a price which is the lowest (low) and another price which will be the highest (high). The last trade of the day is considered to be the closing (close) price. This information as well as the volume or number of shares traded during the day is generally all of the data which is collected for each stock each day. Another charting technique, invented by the Japanese, is the candlestick stock chart. Below is the same information as the above chart (Microsoft Corp., three months) represented as a candlestick stock chart. In the above candlestick graph, the clear boxes represent days where the close was above the open while the colored boxes represent days where the close is below the open. Now let us look at the same stock in a different time frame. Below is a three year weekly chart of Microsoft (MFST). Note that the right hand side of the three month daily chart (above) tells us that MSFT is going up while the three year chart is telling us that during the week of Aug. 1, 2005 MSFT hit a new three year high. What can you see on stock market charts? Stock traders use charts to identify trends and areas of support and resistance. 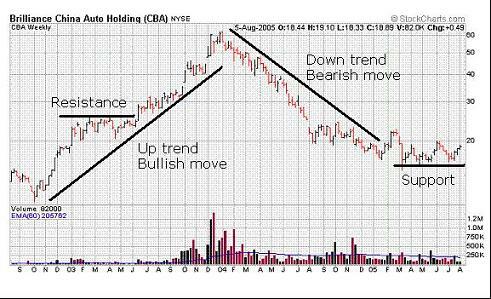 To demonstrate this, a three year stock graph of Brilliance China Auto Holding (CBA) is shown below. Four major chart patterns of interest are identified on this stock market chart. Resistance: A price through which the stock has not been able to penetrate above. Penetrating above resistance is generally considered bullish. Support: A price through which the stock has not been able to penetrate below. Penetrating below support is generally considered bearish. Up trend or bullish move: The major trend of the stock is up. Downtrend or bearish move: The major trend of the stock is down. When you are beginning stock chart analysis, the patterns look complicated. However, after you view hundreds of chart patterns you will begin to see areas which offer higher probability trading potential. You can view free stock charts on most of the major charting websites. Some of these have been highlighted in our resource section. After you become familiar with the standard open, high, low, close chart you may want to start exploring candlestick chart patterns. To learn more about a stock market chart take a look at the references in the technical analysis book review section. One book that contains a lot of information on stock charts is "Secrets for Profiting in Bull and Bear Markets" by Stan Weinstein. Another approach to learning more about stock market charts is to see how other traders are using them. If you are interested in improving your trading results, take the first step and start to get educated now. Below is an offer from a trader which should be able to educate you a bit more in the area of stock market graphs. The Truth about Trading for a Living, written by David Graeme-Smith is based on the fact that he has supported and trained well over a thousand traders and seen all the common mistakes traders so often make. The book describes the difference between what the successful 10% of traders do as opposed to the 90% who end up losing enough money to make them quit. This book can be understood by all levels of trader and will benefit the novice as much as the expert and is a "must read" whether you intend to trade for a living or not. David pulls no punches and tells you exactly what the real world of trading is all about. Any trader who does not do what is described in this book will almost certainly become one of the trading tragedies. If you want to look at more ways you can improve your trading skills visit our other product offerings.